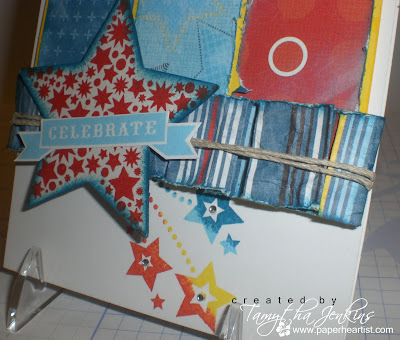 Welcome to the CTMH July Stamp of the Month Blog Hop! The blog hop makes a circle so if you are starting here just continue until you make your way back and you will have made it through them all. 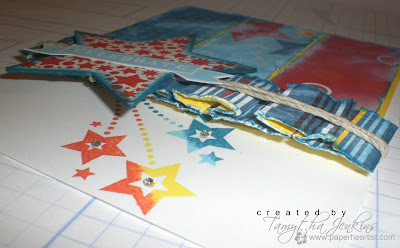 If you have already started and are coming from Traci Godbee's blog, "Create with Traci", then you are on the right track. For my first card, I was inspired by a card in the May/June 2011 Paper Crafts magazine on page 29, created by PC Creative Editor, Susan R. Opel. 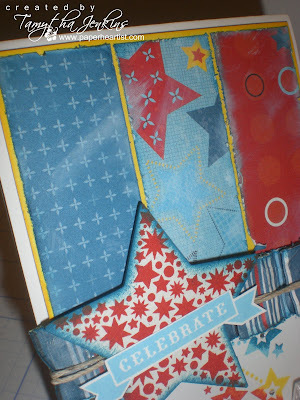 I wanted to the card to be fairly distressed, so I scored the striped B&T paper to create a box pleat, inked and distressed the edges, then crumpled the paper strip before folding. I adhered the box pleat with foam tape. 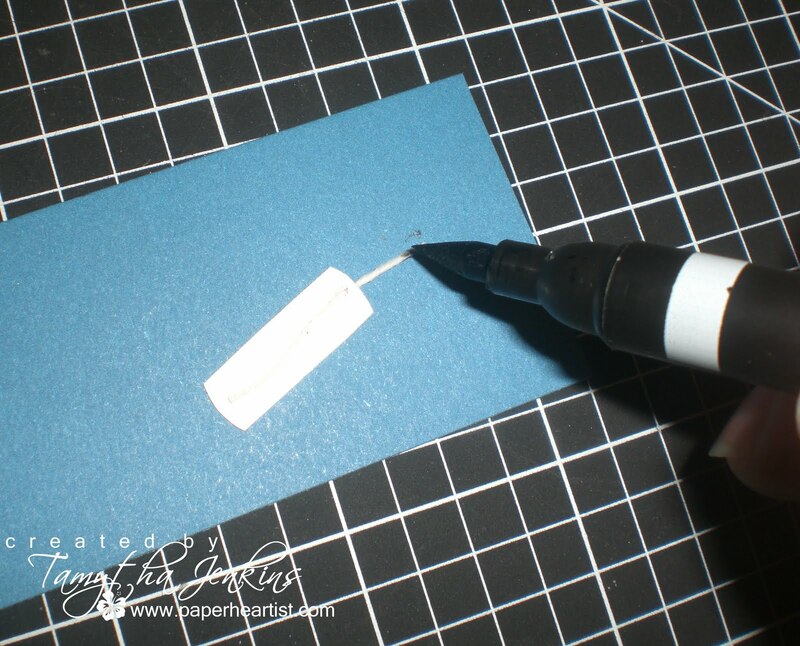 After inking and distressing the edges to each of the three B&T strips, I rubbed White Daisy Pigment ink directly onto the paper, creating a white-wash effect. 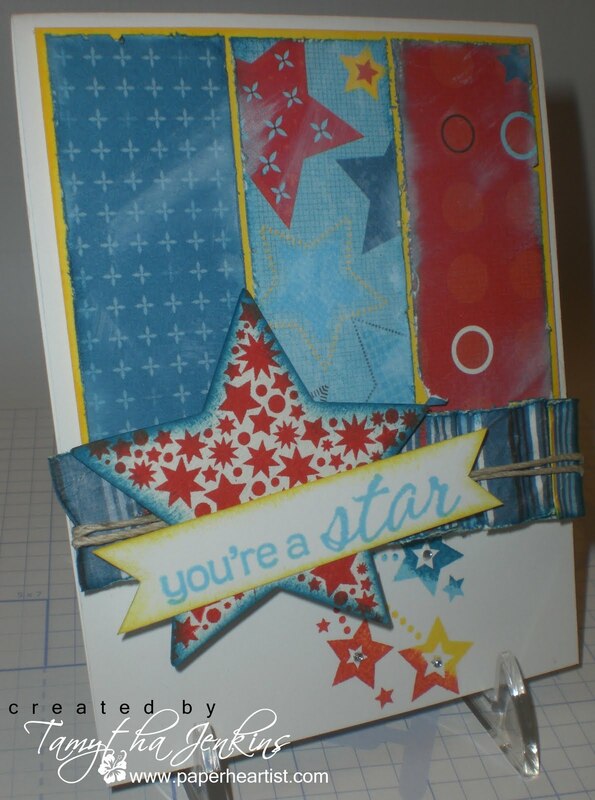 I stamped the large star stamp directly onto the dimensional element star. I originally had sponged the star with the Sunny Yellow, but when I inked the edges with the Pacifica, the area where the two colors came together, looked green. Duh...blue and yellow = green! Maybe it wouldn't do that if I was actually more patient and let the yellow dry more thoroughly. But since I'm not that patient, I just flipped the star over and started over, but this time without the Sunny Yellow. A little look at the dimension on the card. The first version could be used for any celebration, not just the obvious. However, I don't personally have a need for 4th of July cards, so I thought it would be fun to show another use for this stamp set by using a more general sentiment from another stamp set. 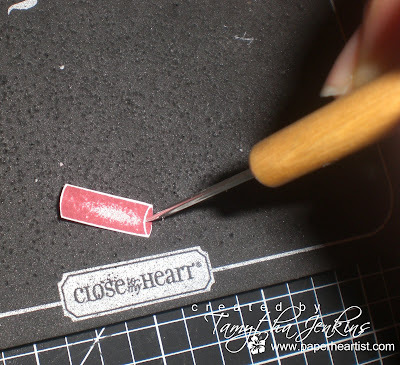 My second card is 3 1/2" x 8" and was inspired by this week's Heart 2 Heart challenge, which happened to be a color challenge that included colors perfect for this stamp set. I also wanted to see if I could use some of the stamps in ways that they probably weren't initially intended. For example, I used the stripes in the flag to create the striped pattern on the bottom of the card. I also used the firecrackers as dynamite and the stars (that I think were meant to be sparkles from the firecrackers) as a border. I also used some newly acquired letter stamps to create my own sentiment. I think it turned out kinda' cute. 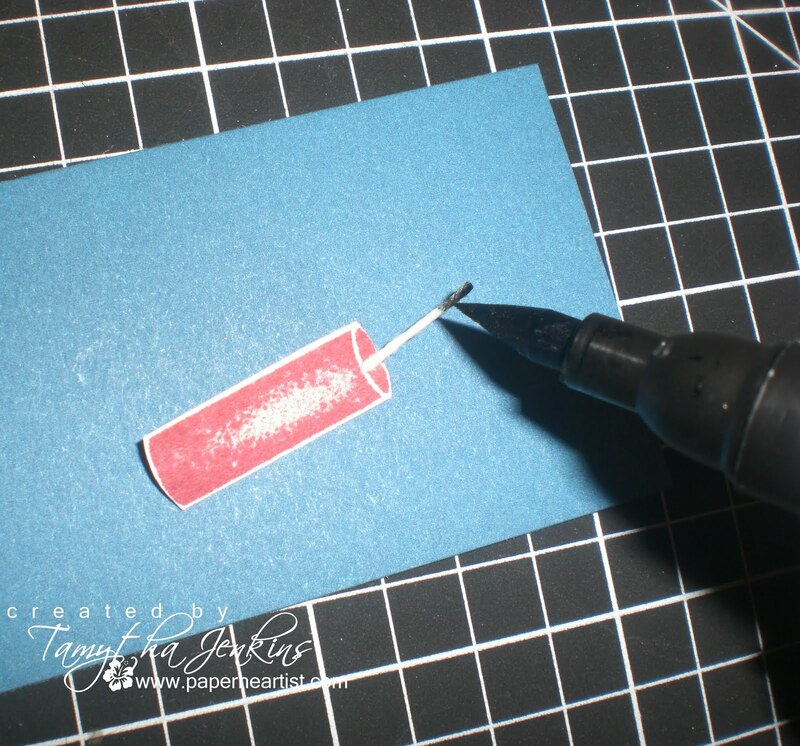 Here's a little photo tutorial on how I created the "dynamite". 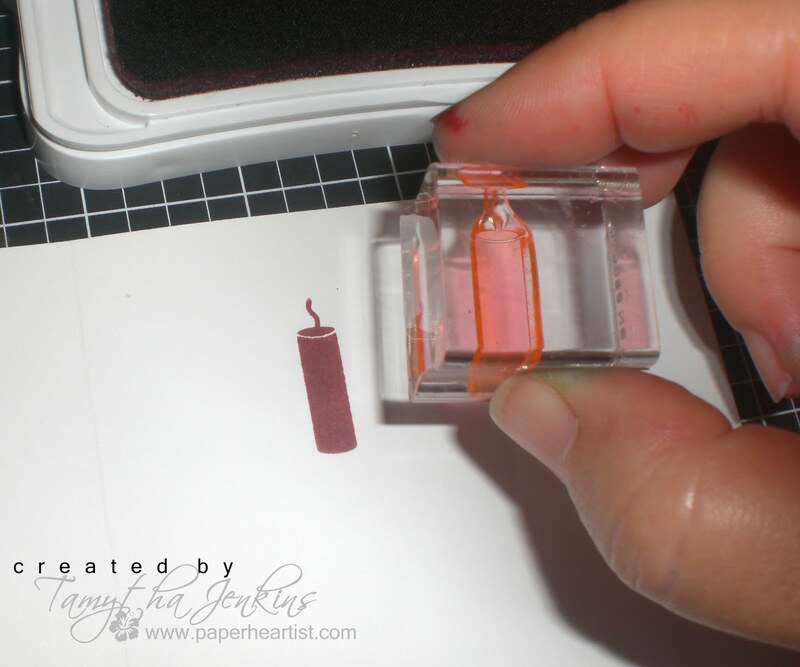 Touch all four sides of the stamp in the Barn Red ink, trying to leave the length of the center uninked. Now stamp on White Daisy Cardstock. Repeat these first three steps two more times. You can see through the block, how the rockin' and rollin' technique gives a highlighted affect. 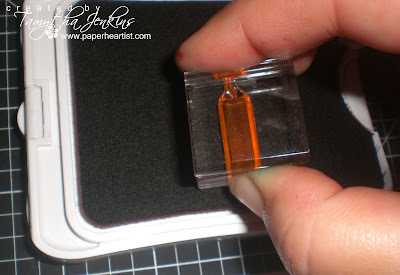 Trim out, cutting away the "fuse". 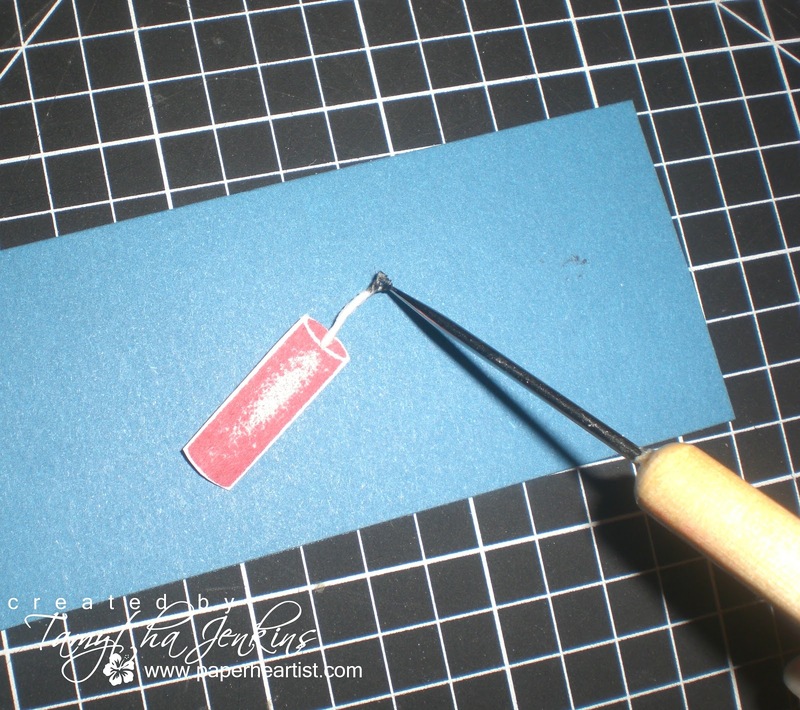 Pierce a hole in the end of the firecracker....not to close to the edge though, as the hole will tear when you thread the waxy flax through. Thread a piece of Colonial White Waxy Flax through the hole, adhering to the back of the firecracker. 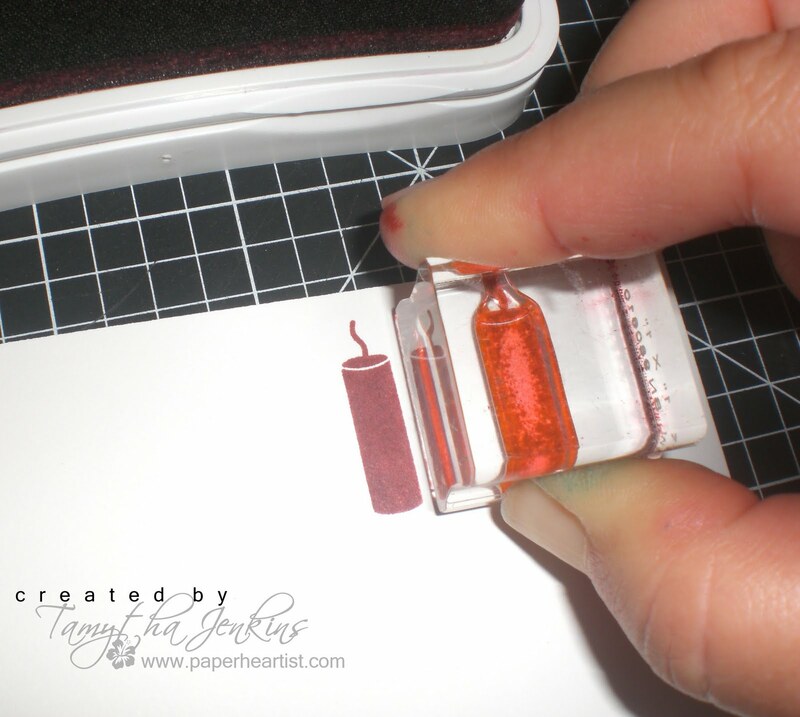 Then trim the "fuse" to the desired length. Using a black (or dark brown) marker, color the end of the waxy flax to represent a burned "fuse". Be sure to color the flax all the way around. 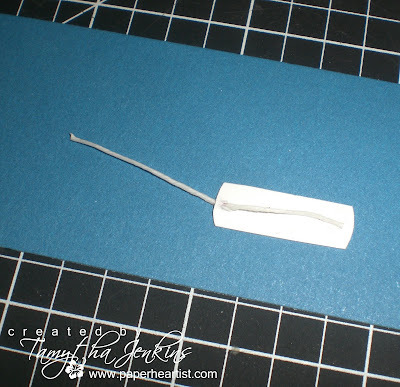 Using the end of the piercing tool, or your fingernail, split the end of the waxy flax. 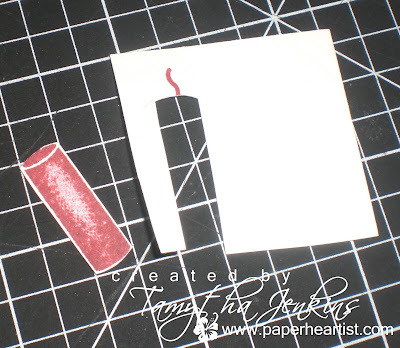 Adhere to card with 3D Foam Tape. 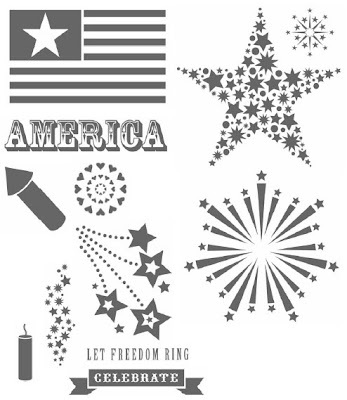 Remember, if you love what you've seen so far along your SOTM Blog Hop journey, and you want your own "American Celebration" stamp set at a discount or for FREE, be sure to contact your Close To My Heart Independent Consultant. If you don't already have a consultant, I'd love to be yours. You can find details on the "Stamp of the Month" here on my blog, or by clicking on the "Stamp of the Month" tab at the top of the page or by clicking on the "Shop with Me" link near the top right. Of course, if you have any questions, please don't hesitate to contact me. If you have time, take a moment or two to check out the rest of my blog. 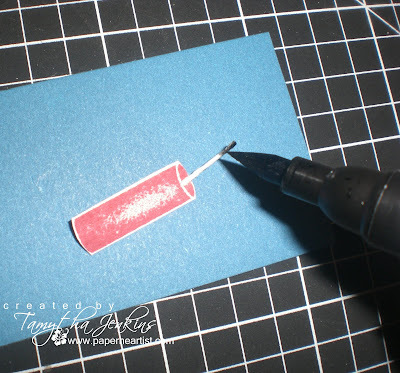 If you enjoy your visit, then please consider "Following Me" and/or leaving a comment (we all love comments...the nice ones anyway), then be sure to continue along on the hop by heading over to Sheila Bennett's blog, "Sheila's Stamping Stuff" and check out her creation. so cute!!! I love both cards! I just love the details on your firecracker card - fabulous! 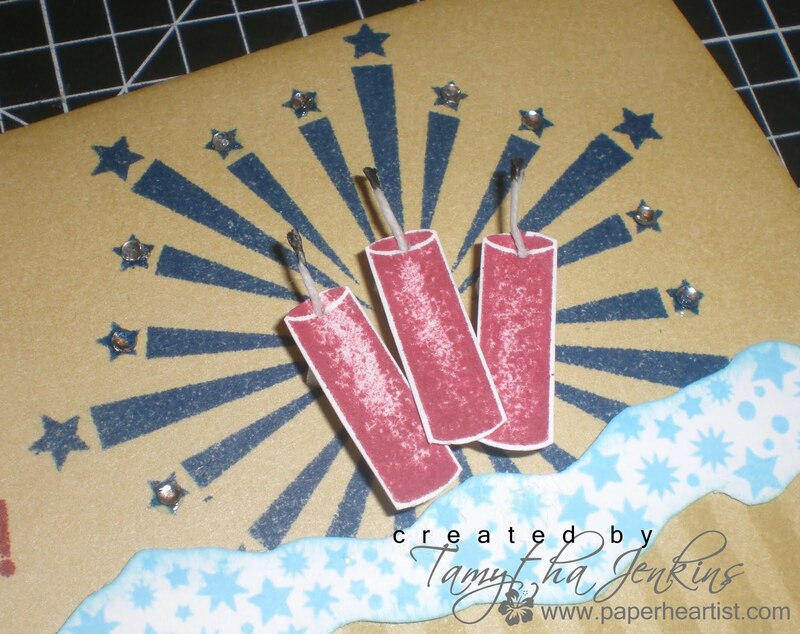 Great idea on the firecrackers! I love all the great techniques you used with these cards. 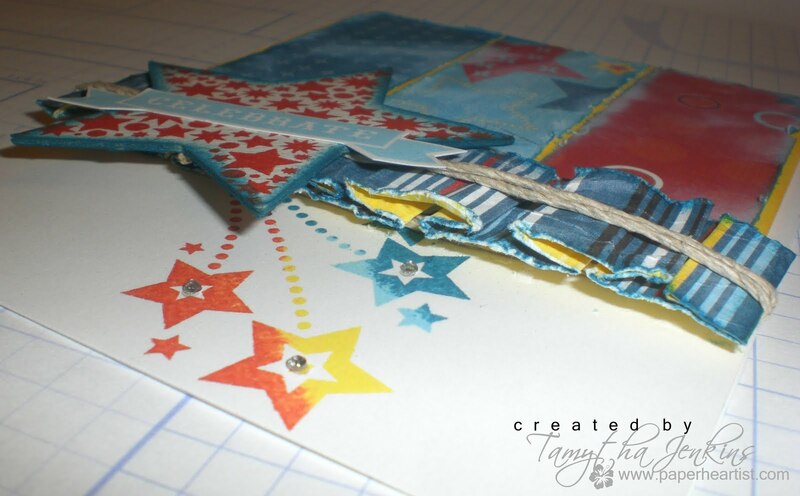 I love all the techniques you used on your fabulous cards! Wow! I love both your cards! Stunning. Nice cards! 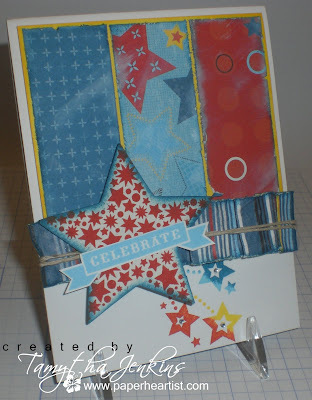 I really like how you stamped the stars using colors to match the paper in the first card. And your fuses on the second card are awesome. I love your cards! Especially the first one! The multi-color shooting stars make a big impact. Your cards are wonderful. Thanks for all the great tips!! 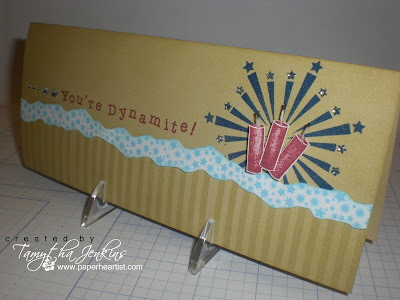 You're DYNAMITE! Wonderful ideas. Love the depth and dimension with all the texture. Beautiful cards, I love the effects you created with the firecrackers! Nice tutorial! I love love love your first card! I think I may scraplift! Both of your cards are great!